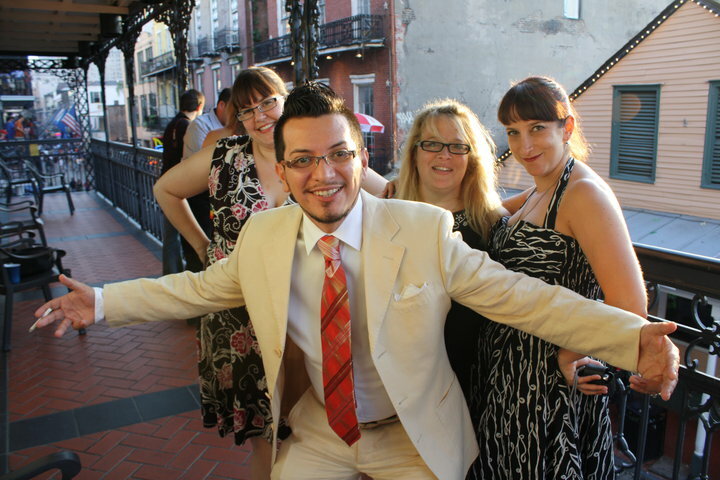 I’m back and only halfway (mentally) recovered from my second Tales of the Cocktail, which celebrated its ninth anniversary in New Orleans this year. The resounding opinion this year was that it was not quite as fun as last year’s Tales, and everyone agrees it’s because Selena was not there. We’re already training our livers for her return in 2012. Grey Goose Inspire: I hopped over to Latrobe’s to kick things off at this event which featured four bespoke bars piled high with fresh produce, herbs, juices, garnishes and other beacons of summer abundance. 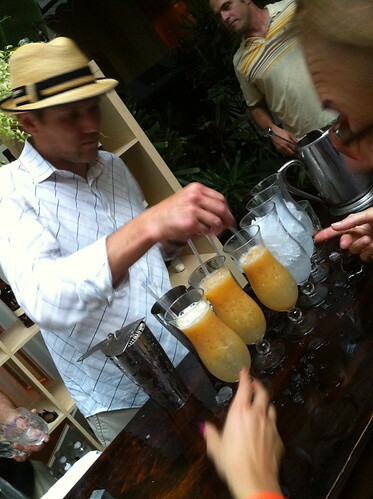 Guests collaborated with bartenders on an array of ingredients, mixers, garnishes and product to create their own cocktails. Grey Goose Brand Ambassador Nick Mautone made me a delicious cocktail with the citrus notes I picked out, and there was also a juicy watermelon libation being passed. Great way to cool off before heading out into the steamy NOLA night. Self-professed rum nut Rocky Yeh mixed up a mighty tasty “Ants in My Pants” with Dos Maderas 5+3 with rosemary and pineapple syrup. He was kind enough to dole out some straight pours when the night started getting interesting at the event’s secret venue in the French Marketplace. Also making an appearance were Trevor Schneider, fresh back to the U.S. from Australia and NYC’s Enzo Lim. 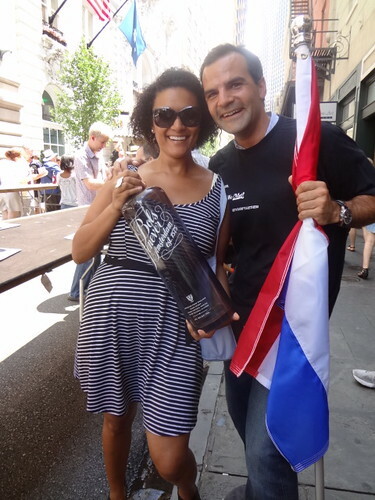 On Wednesday, Tales’ Official Day One, I enjoyed the Opening Toast at Hotel Monteleone where, with over 400 folks, I knocked back a “Kopstootje” (a shot of Bols Genever paired with a beer) to set the world record for the World’s Largest Kopstootje. I got a warm welcome by Brand Ambassador Tal Nadari and managed to down the shot of Bols without getting it all over myself. Great success. Another highlight of Day One was the Cocktail Fresh Market, which showed off cocktails made with ingredients from a local farmers market and 18 new and traditional spirits. I spied Russell Davis of San Francisco’s Rickhouse mixing things up with classic Luxardo maraschino liqueur and The King’s Ginger, an intense ginger liqueur and relative newcomer to the U.S. market. 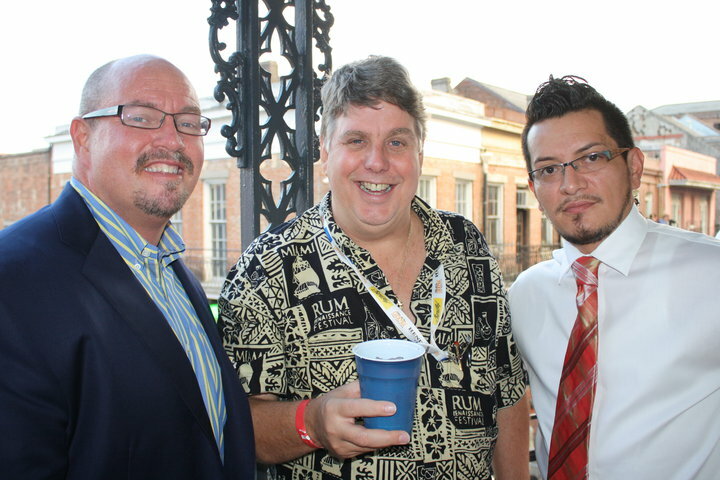 After that it was rum and more rum, as I hit the Zacapa Rum Garden Party at the St. Louis Hotel and the Brugal Rum Poolside Party on the rooftop at Monteleone. Zacapa’s shindig was a classy affair studded with colorful frozen cocktails and a buffet of what looked like delicious apps (got there too late to partake myself). 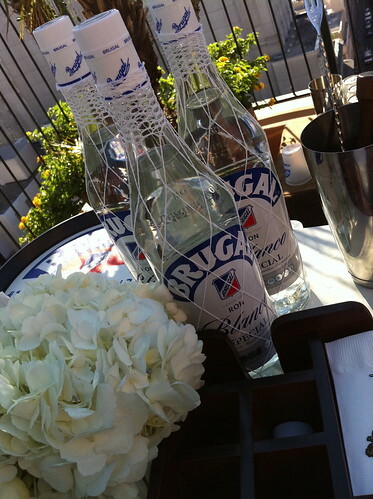 Brugal’s party featured a secret room with a private tasting nook to sample Brugal’s newest release, Brugal 1888. 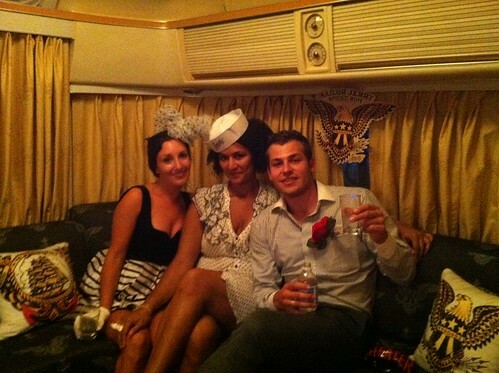 In the Sailor Jerry RV with friends at the William Grant Portfolio Party. 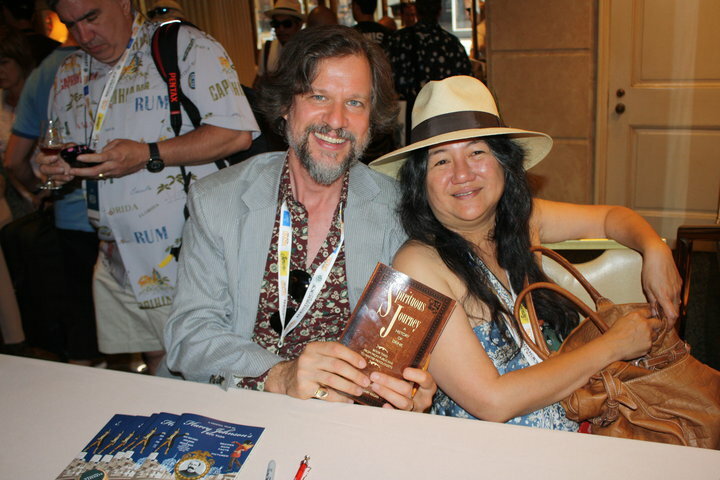 I was happiest with a drink from Julie Reiner in my hands, though it was wonderful to see Gable Erenzo (Tuthilltown) and his lovely wife dressed up in ’40s character. The highlight of the evening was probably the mashup of this year’s official Tales cocktail and the “-est” theme with the “Freshest Ramos Gin Fizz,” made by the Hendrick’s Gin team using freshly-laid eggs, cream churned from a cow that was right there, at the party and just-picked lemons (though we didn’t spy any lemon trees around). And that’s just Tuesday night & Wednesday! Stay tuned for the next wrap-up post with a recap of the Negroni workshop, Pierre Ferrand‘s launch of their Cognac 1840, making our own pressure-infused cocktails at the Purity Vodka Bloody Mary Brunch and highlights from the 2011 Bar Room Brawl. Bartenders, brand ambassadors, booze purveyors, drink writers and cocktail enthusiasts are flocking to New Orleans this week for the 9th Annual Tales of the Cocktail, kicking off today. For personal reasons, I won’t be attending this year, and I’m nostalgic just thinking about how much fun I had last year, but luckily my friend and fellow blogger-in-crime Emily Cavalier of Mouth of the Border will be reporting highlights for you, dear readers. For a sneak peek of Emily’s adventures at Tales, check out her Flickr stream here. 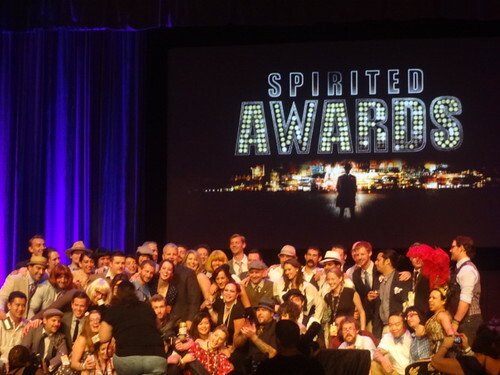 Spirit launches, giant Negronis, seminars, networking, the Spirited Awards and endless parties are on tap–and don’t even get me started on the food. For those of us stuck in the hot concrete jungle, be warned that most of your favorite bartenders are out of town, so this might be the week to order a beer or glass of wine. 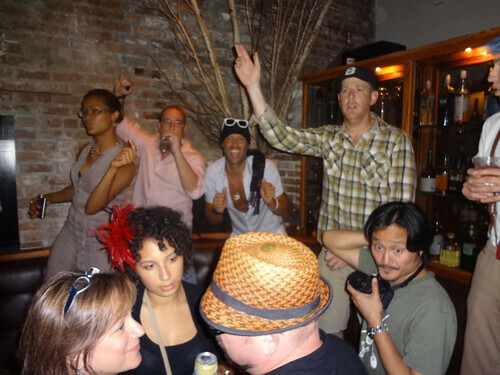 In fact, Dram in Williamsburg is skipping cocktails altogether while its staff is at Tales by converting into a dive bar, 86’d, serving domestic beer, White Russians and shots like the pickleback. Have fun at Tales if you are going, and don’t forget to hydrate! 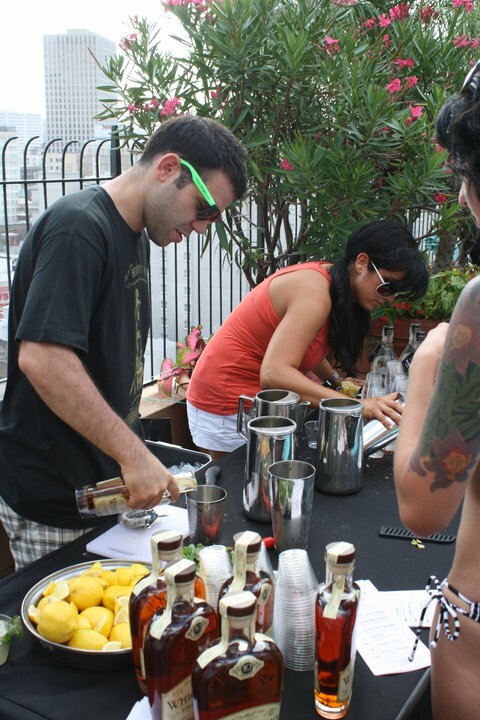 The scene at Hotel Monteleone's rooftop pool at Tales last year. The crowd at Domaine Select’s Classic & Vintage Pool Parlour, July 22, 2010. 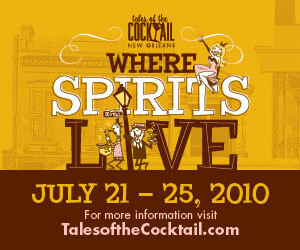 Finally, the Sazerac-tinged haze has cleared and I can somewhat recall what happened between the dates of July 21-25, 2010, for what was the 8th Annual (and my first) Tales of the Cocktail in New Orleans. And what tales I have returned with! Although, I’m afraid, dear readers, about half of those tales I will either keep to myself or have simply lost to the foggy grip of intoxication. I was warned not to overschedule myself, and now I know why–I didn’t go to anywhere near as many seminars and events as I had planned. I learned a few hard lessons (Drink more water! ), and will certainly try to do better next year, but as my friend and hotel roommate Carmen Operetta Carroll said, “You’ll never be able to train for Tales.” All I can say is, expect the unexpected! The Beefeater Welcome Party: Not long after landing in Nawlins, I got gussied up and headed straight to the New Orleans Contemporary Arts Center for a scene outfitted in British flags, citrus chandeliers and whimsical characters straight out of a Lewis Carroll acid trip. Carmen and I had fun posing in a Queen of Hearts garden-themed photoshoot before the cocktails took over. With some of the best bartenders in the biz behind the stick–Audrey Saunders, Kimberly Patton-Bragg, Kenta Goto, and Erick Castro, to name a few–I knew I was in for some decent gin-bibing. The William Grant House Party: Following the Beefeater bash, buses took everyone to the Elms Mansion for this grown-up version of a frat party. The elegant setting maintained a casual feel with a vintage Sailor Jerry Rum photo backdrop, and a sprawling backyard featured a live jazz band and endless cocktails from other spirits within the William Grant portfolio. Thankfully there were buses to take us back to the Monteleone, as I was a little “dizzy” at this point. “Summer in Paris” Spirited Lunch: What do Chartreuse, Benedictine, Tennyson Absinthe, Dubbonet, Pierre Ferrand Cognac and Citadelle Gin have in common? Oui, all made in France, and all quite délicieux, I might add. These and other spirits were served in abundance along with a French-Creole meal that ended with flaming Baked Alaska at Antoine’s, built in 1840. Domaine Select’s Classic & Vintage Pool Parlour: Retro pool attire was in order at this sunset bash hosted by Domaine Select’s Classic & Vintage portfolio at the Hotel Monteleone rooftop pool. 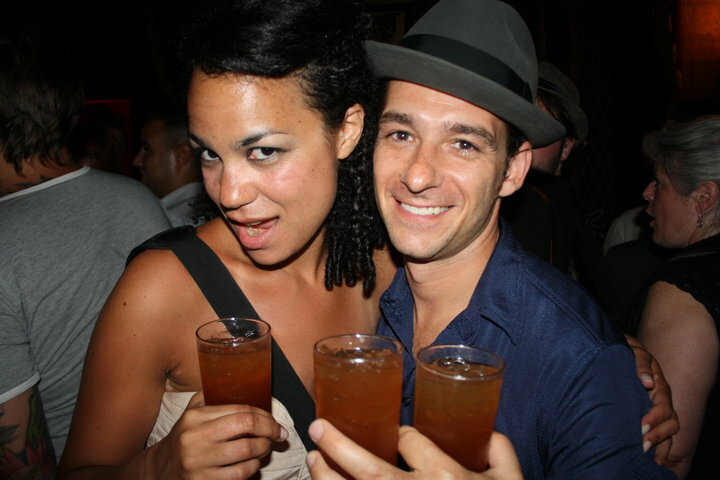 The Tippling Bros. and their startender team turned out refreshments such as the “Lightning Collins” (Death’s Door White Whiskey, Dimmi liqueur, lemon juice, simple syrup and club soda) and the “Top Cat” (Averna Amaro, muddled strawberries, lemon juice and Fanta orange soda). I was hoping for a swim-up bar, but I still managed to sip and dip at the same time. Unofficial Spirited Dinner at Elizabeth’s: While many Tales attendees shelled out $85-$100 a head for the luxury of impeccable dining at some of the most reknowned restaurants in NOLA–with cocktail pairings, natch–I joined a group of about 18 for a layman’s version at Elizabeth’s. I got to know a bunch of fun Bostonians and had some killer fried chicken paired with beers and shots–all for the cool price of about $40 a head. The History, Science and Creativity of Essential Oils and Extracts: Ah yes, the one seminar I managed to attend. Although I had a wretched hangover at this point, I enjoyed learning from Darcy O’Neil and Andrew Nicholls about the chemical breakdown of essential oils and phosphated sodas in cocktails. Be sure to use food-grade essential oils in your cocktails, and use them sparingly, such as a spray of lavender oil, so the aromas don’t overpower the drink. Fun fact–Coca-Cola is made with the following essential oils: orange, lemon, nutmeg, cassia, coriander, neroli, lime and lavender. Don Q and Esquire party at Restaurant August: Don Q Rum’s mixologists James Menite and Esteban Ordonez kicked off another night of cocktailing with Puerto Rican-themed crowd-pleasers such as the “El Viejo San Juan” (Don Q Anejo, Dolin Dry Vermouth, Luxardo Amaro, Luxardo Maraschino liqueur, and orange peel scent). 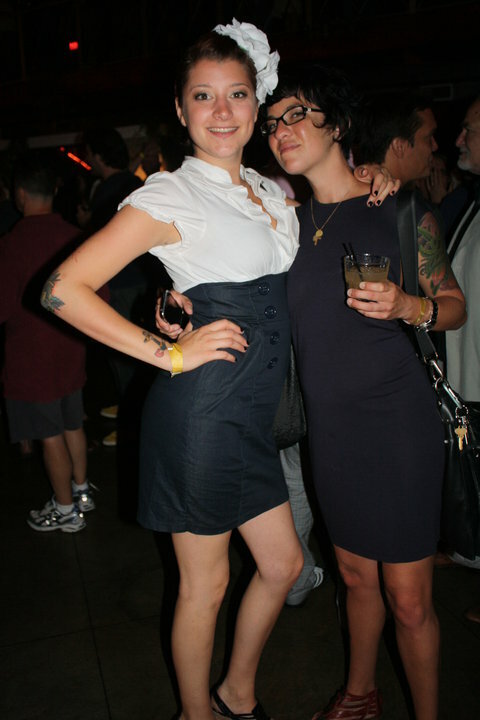 Being an Esquire bash, everyone was smartly dressed with drink in hand. 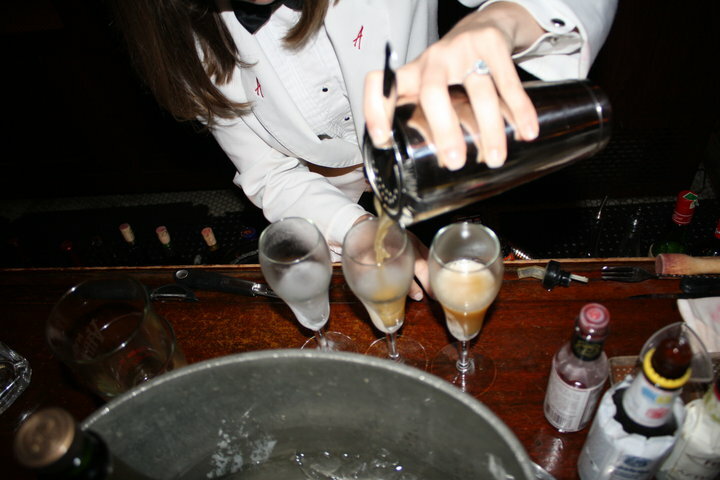 French 75s at Arnaud’s French 75 Bar: In-between events, I joined a couple of New York imbibers at this classic bar just far enough from the brouhaha of Bourbon Street. We sipped Cognac French 75s, admired the antique decor, and chatted up a local, however, our Ramos Gin Fizz left much to be desired–mainly, citrus. Latenight pool party with Belvedere and U’Luvka vodka: I don’t want to give away the location of this pool party because I want to stay at this hotel next year at Tales. No photos were taken, but imagine a lush garden scene, throw in a full moon, and let your perverted mind wander from there! The Gran Marnier Bar Room Brawl: This massive throwdown at Generations Hall featured teams of bartenders from six of the country’s top cocktail bars: Dutch Kills in NYC, Florida Room in Miami, Rickhouse in San Francisco, Drink in Boston, The Drawing Room in Chicago, and Varnish in L.A. Hosted by aka Wine Geek, this was one of the most well-executed competitions I have ever witnessed–with stellar mixology to match. 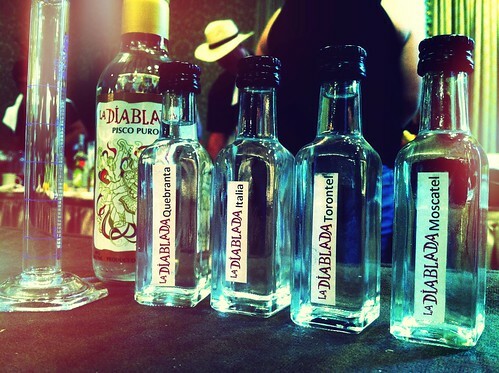 Congrats to Drink for taking home top honors! Breakfast at Coop’s Place: Nothing like a plate of blackened redfish, a cup of coffee, and a shot of Ardbeg Scotch to get the blood flowing again. It took me about 20 minutes into breakfast to take my sunglasses off–yeah, Tales hangovers are like that. Pre-awards drinks at Don Q’s hotel suite: From a balcony at the Royal Sonesta Hotel overlooking Bourbon Street, a handful of friends of Don Q Rum toasted (water and Diet Coke for me) in advance of the glamorous Spirited Awards. I would like to personally thank John Eason for the invite! The Plymouth Gin Bartender’s Breakfast: Nothing to do with breakfast, everything to do with debauchery. 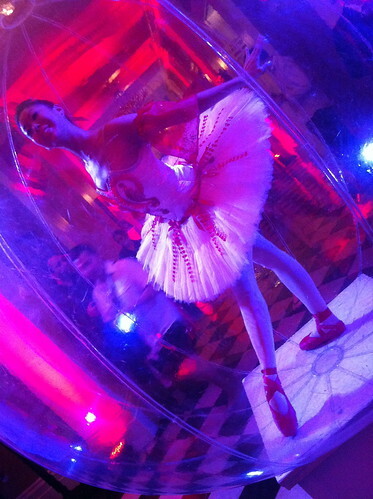 One of the most anticipated–and deservedly so–events at Tales. Beignets at Cafe Du Monde: Believe the hype! Even at 7:30 a.m., we had to wait in line for these hot, pillowy doughnuts doused in powdered sugar, with chicory coffee to boot–post-boozing indulgence at its finest. Brunch at Brennan’s: White tablecloths, Southern hospitality, perfect Bloody Marys, rich eggs Benedict… I’m so glad Emily Cavalier took me here–always trust your food blogger friends. Dinner at Bacchanal Wine Bar: The Sunday night gathering spot for all of the bar industry folk left to finish out the weekend, Bacchanal in the Ninth Ward was a purely magical experience. Everyone took over tables in the backyard where bottles of wine flowed under a picturesque moon, a live band played, and food was eaten faster than it could be prepared. T’was a perfectly chill way to close out a wild week. After-hours drinks at Cure: Not ones to let a party end early, most everyone moved onto Cure, one of NOLA’s premiere cocktail dens. 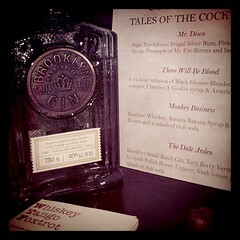 Seasonal- and classic-inspired tipples on par with NYC’s made for a smooth liquid transition back to the Big Apple. 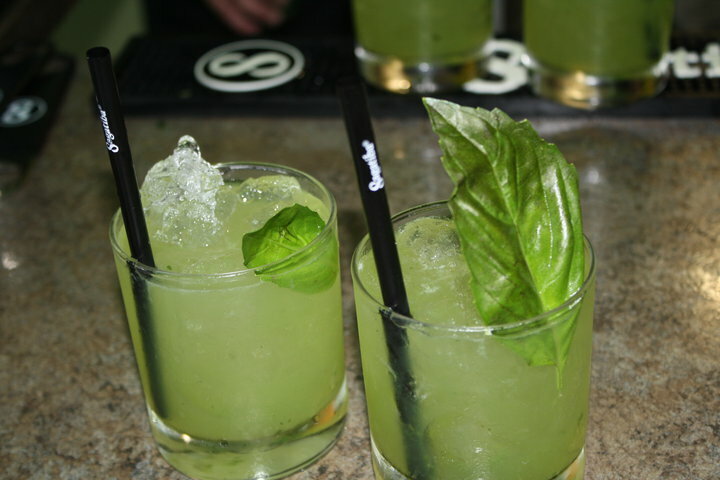 My first drink at Tales–caipirinhas at Casa Sagatiba, before I checked into my hotel! 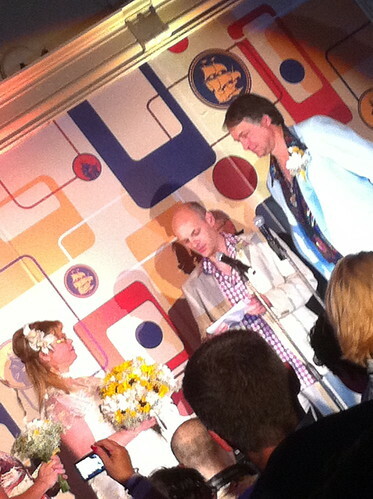 Trevor Schneider gets his flair on at the Beefeater Welcome Party. 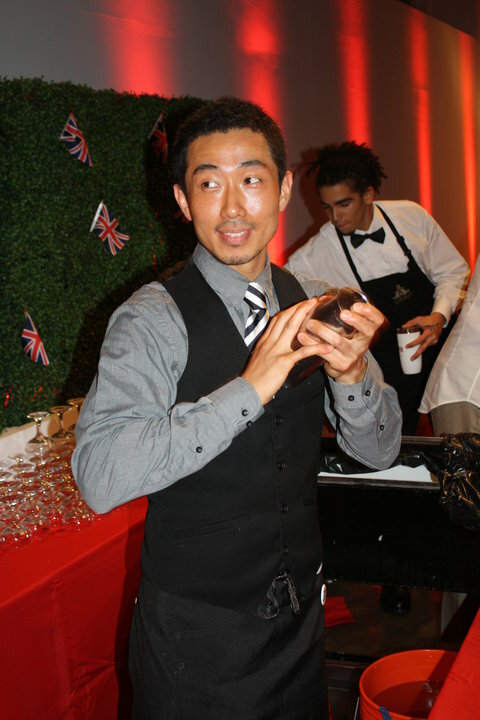 Kenta Goto at the Beefeater Welcome Party. 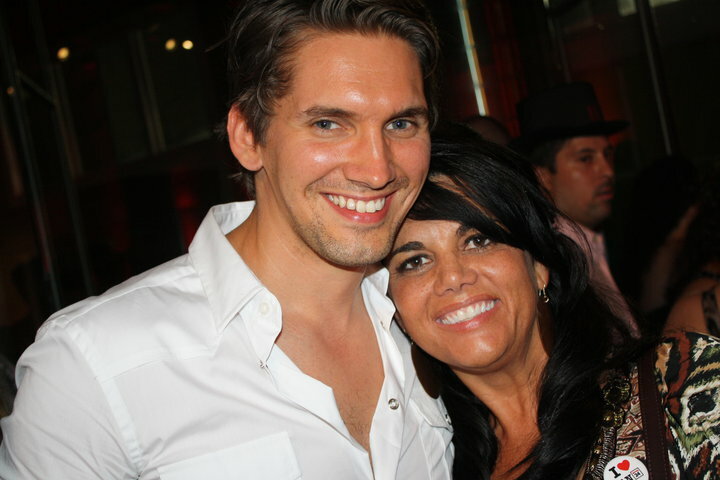 Nicolas De Soto and Cheryl Charming at the Beefeater Welcome Party. 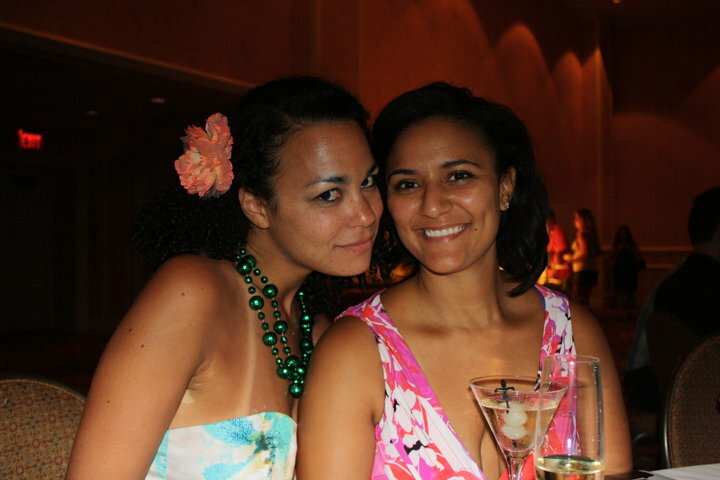 Claire Bertin-Lang and Candice Coy at the William Grant House Party. 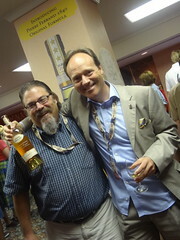 Yours truly and Tad Carducci, triple-fisted at the William Grant House Party. Meaghan Dorman and Laren Spirer at the William Grant House Party. Austin’s Lara Nixon at the “Summer in Paris” Spirited Lunch. Gianfranco Verga and Jennifer Contraveos whip up libations at the Classic & Vintage Pool Parlour. Nicole and Joe Desmond at the Classic & Vintage Pool Parlour. Local lovelies at the Classic & Vintage Pool Parlour. Stephen Yorsz, Phil Pepperdine and Jim Ryan at the Classic & Vintage Pool Parlour. 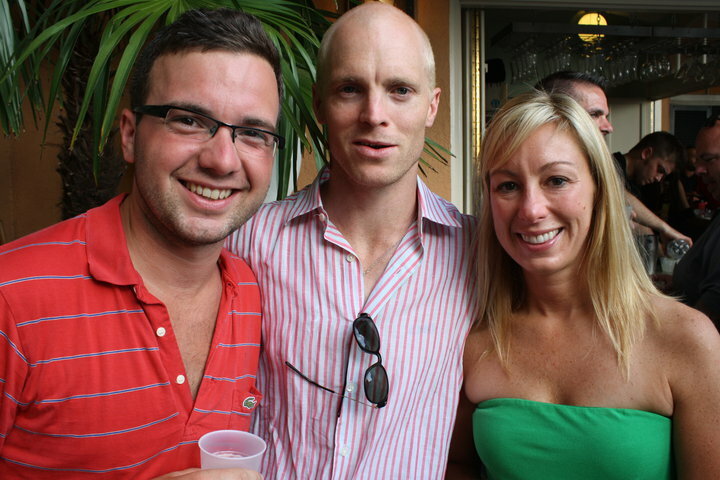 Debbie Rizzo and friends at the Classic & Vintage Pool Party. 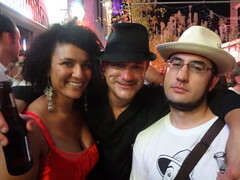 Leblon crashed the party “gorilla” style! 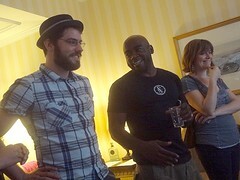 Colin Asare-Appiah, Amanda Gager, Emile Ilane Chaillot and Trevor Schneider enjoy downtime in the Hotel Monteleone pool. 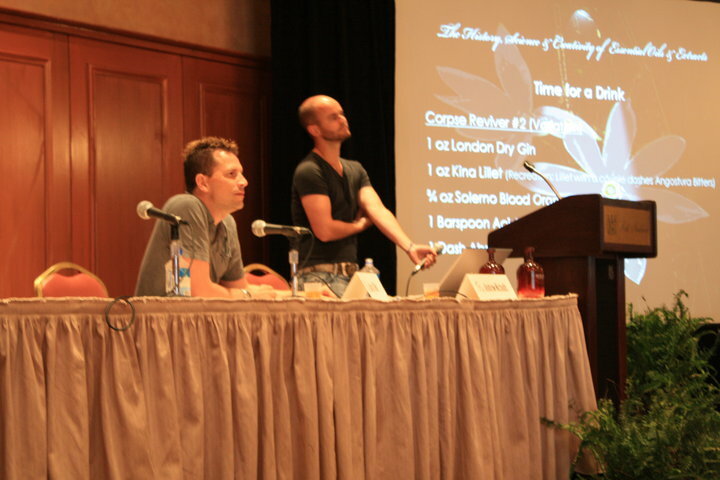 Darcy O’Neill and Andrew Nicholls lead a seminar on essential oils. 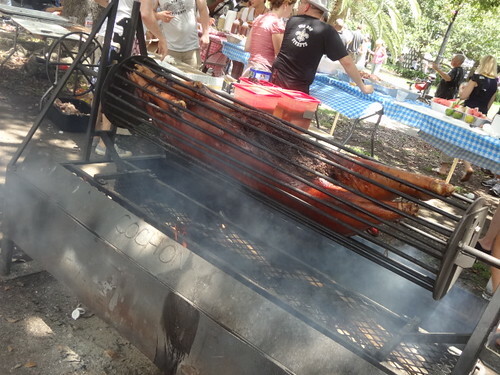 Dinner for six at Cochon, not to be missed. 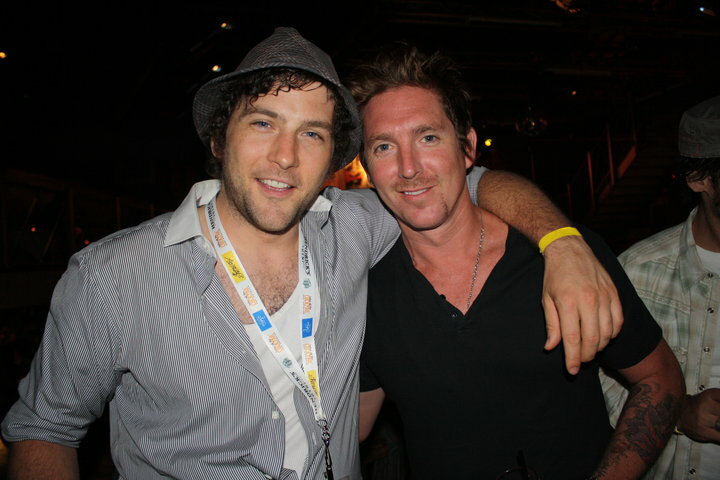 Austin’s Geoffrey Metheny and Josh Loving. 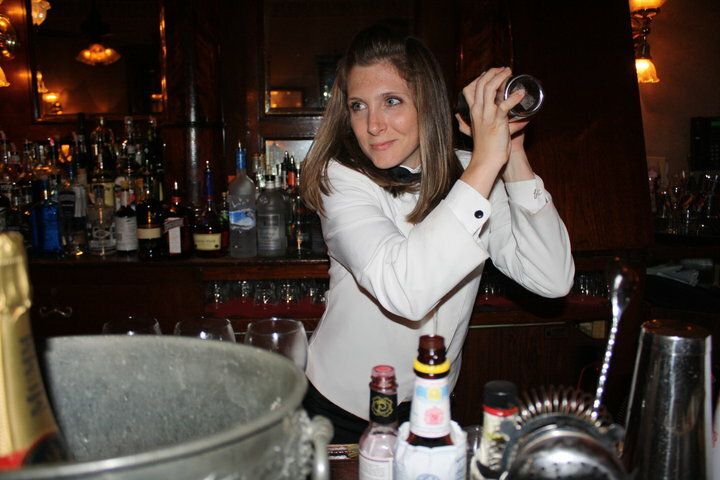 The lovely bartender at Arnaud’s French 75 Bar. Straining those Cognac French 75s before adding the bubbly. 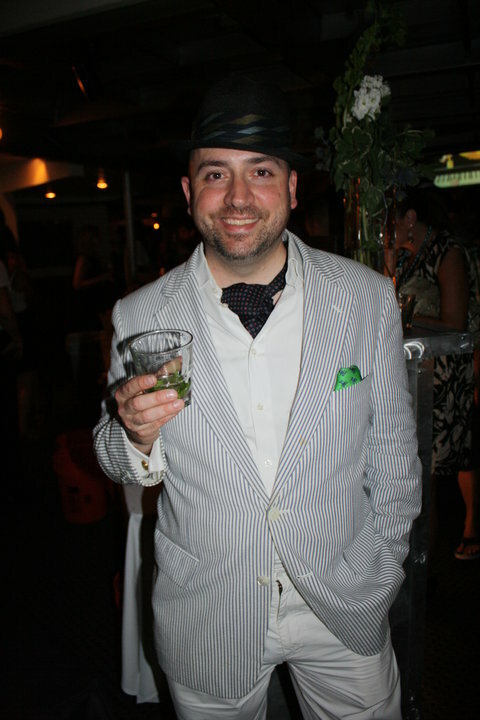 The ever-dapper Fredo Ceraso at the Gran Marnier Bar Room Brawl. 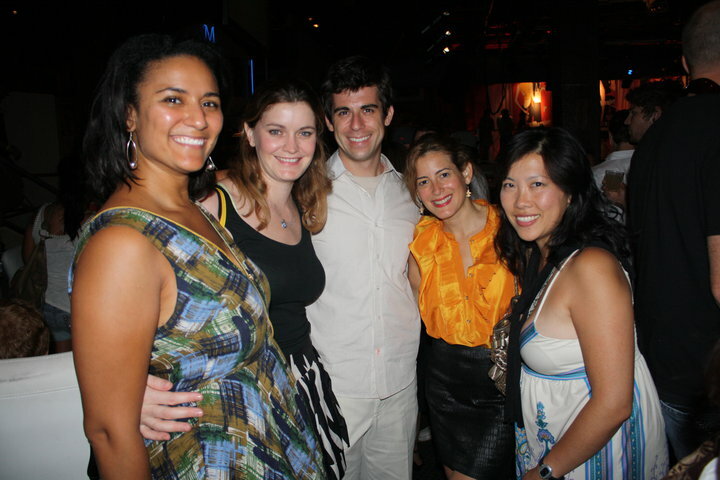 Emily Cavalier, Meghan Manning, Brett Martino, Melanie Asher and friend at the Bar Room Brawl. 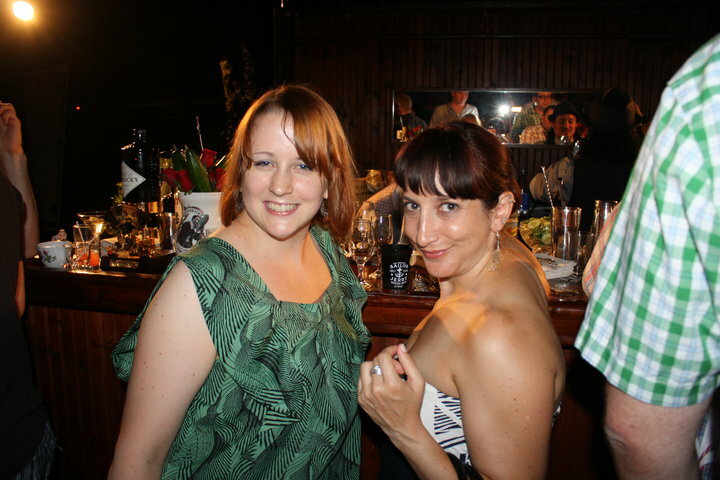 Tonia Guffey and Natalie Jacob at the Bar Room Brawl. 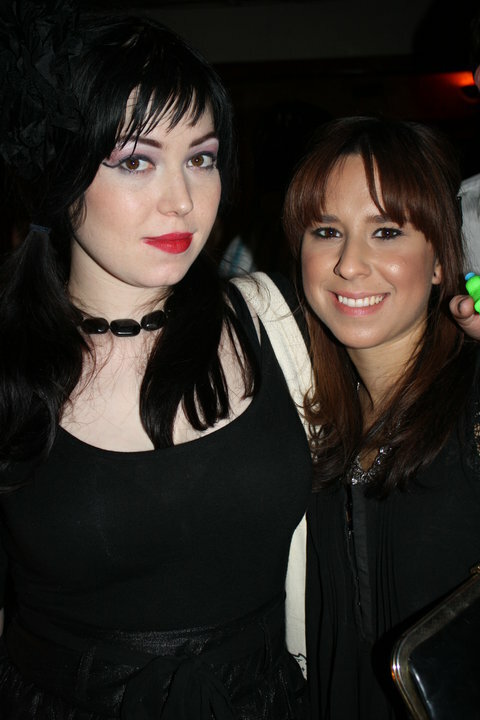 Morgan Young and Mia Consiglio at the Bar Room Brawl. 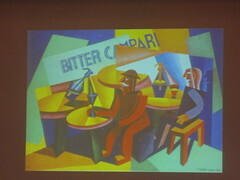 San Francisco’s Russell Davis at the Bar Room Brawl. 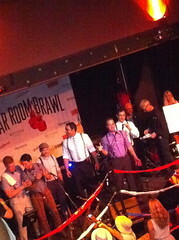 Joe Brooke and Gardner Dunn at the Bar Room Brawl. 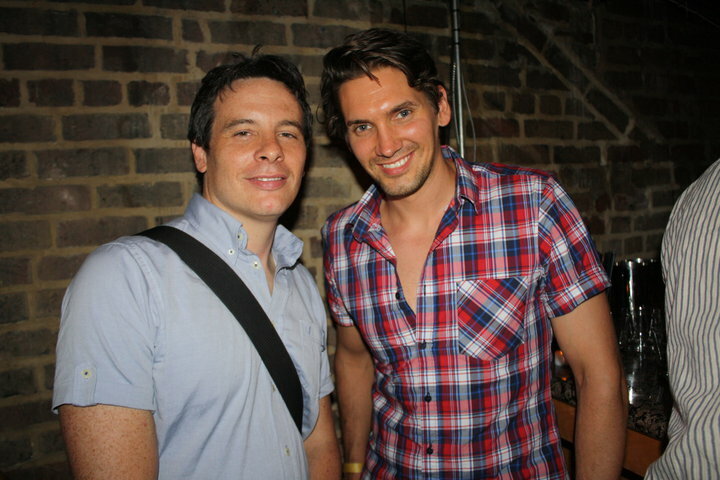 Thomas Chadwick and Nicolas De Soto at the Bar Room Brawl. 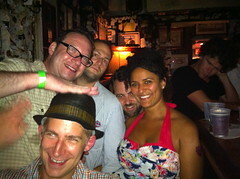 Sam Ross and friends at the Bar Room Brawl. 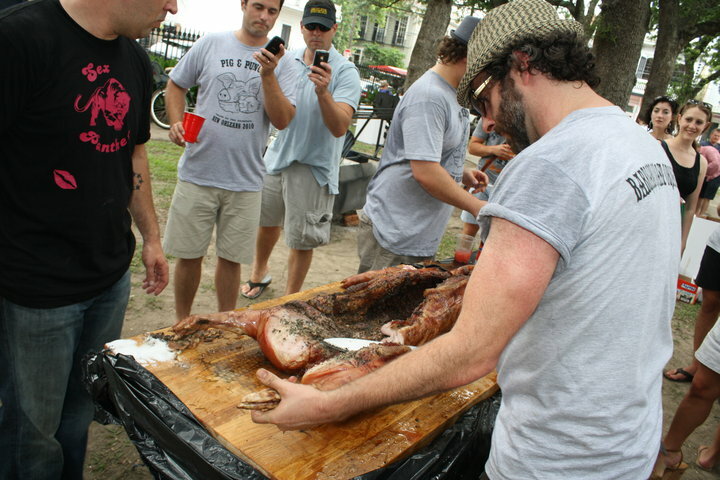 Carving a cochon from Cochon at the Pig ‘n’ Punch fundraiser in Washington Park. Sara Reynolds, Esteban Ordonez, Francine Cohen and Laren Spirer at Don Q’s warm-up before the Spirited Awards. John Eason, Robert A. Burr and Esteban Ordonez at Don Q’s warm-up before the Spirited Awards. 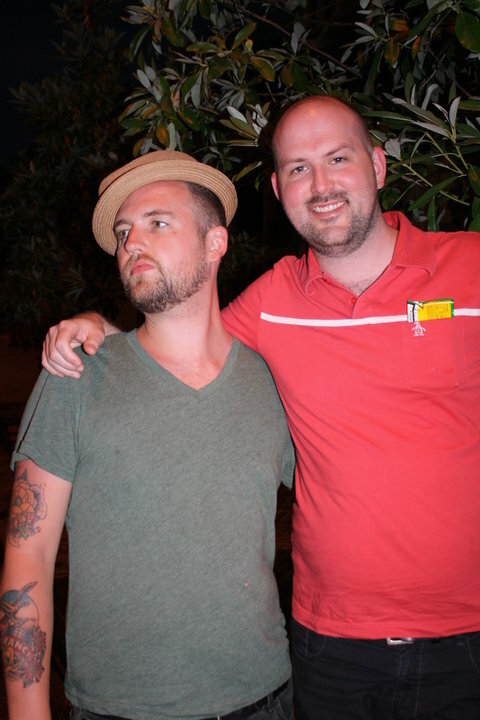 Blair Reynolds and Nick Nemeth enjoy the view of Bourbon Street at the Don Q pre-awards party. 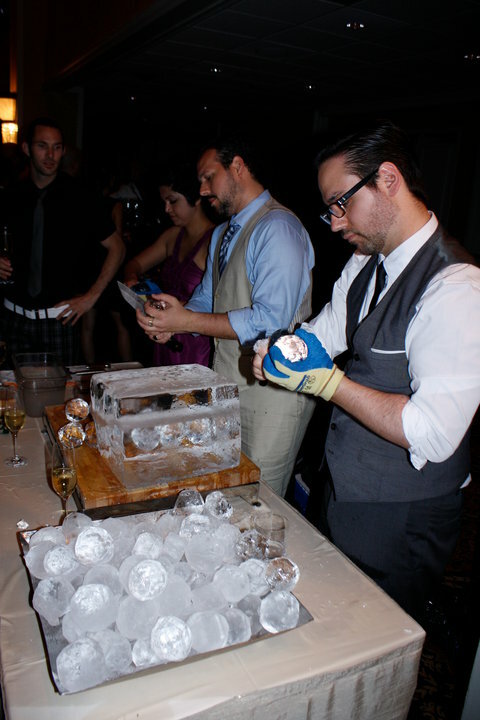 Oh you know, just some Seattle bartenders carving ice balls at the Spirited Awards. 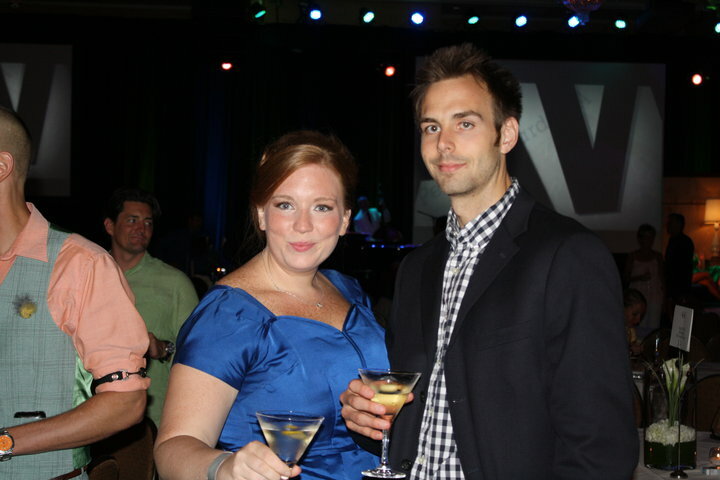 Lush Life’s Lindsey Johnson and Ryan Patrick Johnson doing up the Mad Men theme at the Spirited Awards. Yours truly and Emily Cavalier at the Spirited Awards. For many more photos, be sure to check out The Dizzy Fizz on Facebook. Thanks to Ann Tuennerman and the Tales crew, to my friends old and new, and to the city of New Orleans for being so welcoming–I’ll be back! 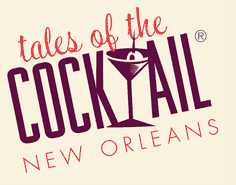 This time next week, I’ll be packing up and shipping out for my virgin excursion to Tales of the Cocktail in New Orleans, the premiere liquor industry gathering for bartenders, brand reps, cocktail historians, writers and enthusiasts from across the country and around the world. 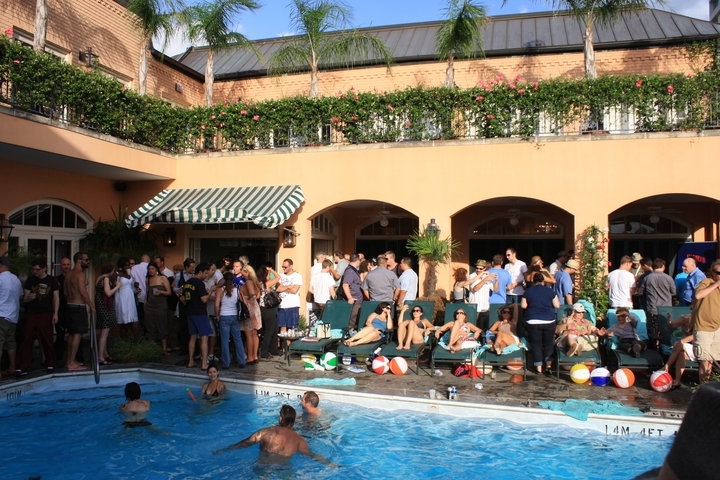 Most of the events at Tales take place at the French Quarter’s Hotel Monteleone (which features a Carousel Bar), and from what I’ve heard, everyone ends up congregating by the pool. I’m hoping to avoid paralyzing hangovers so that I can keep up with a slew of seminars, tastings, and parties, and still be coherent enough to report all of the juicy recaps for you here. Bringing bar tools to Tales? You may want to ship your tool kit to your hotel in advance of your arrival so that you won’t have to deal with the TSA confiscating your citrus knives and ice picks. Leave extra room in your suitcase or bring an extra bag for all of the awesome swag you’ll be bringing home. Or, if you end up with a number of bottles of booze and heavy items, FedEx them home from the Monteleone’s business center. Speaking of timing, try not to over-schedule yourself–just like visiting the Louvre, you can’t possibly do it all. Pick what interests you most. Stay sunscreened–sunburns and intense heat are a recipe for illness, add a hangover and you are destined for misery. 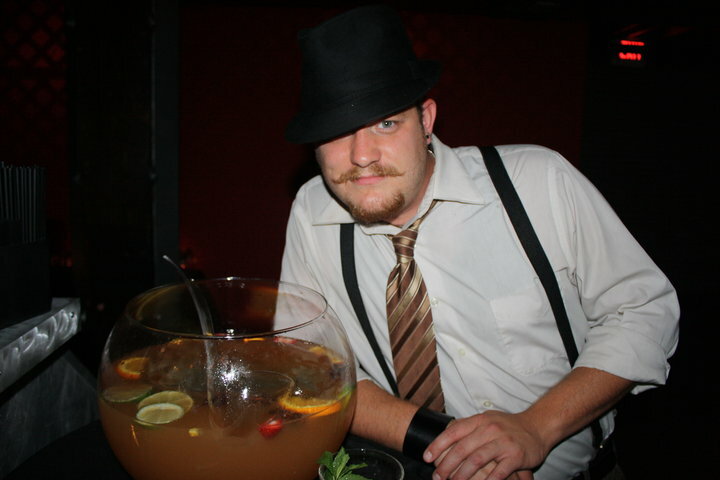 Just because you can drink for free doesn’t mean you have to slurp every cocktail. 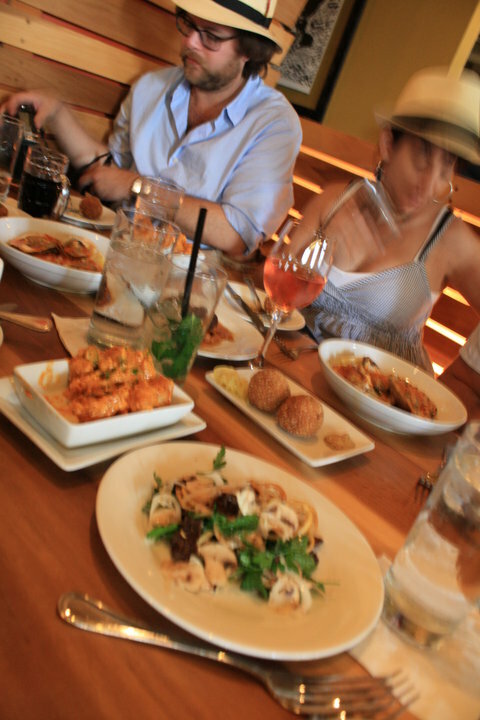 Tasting and spitting might save you from embarrassment, nausea, or worse, a blackout. Bring business cards, and lots of them. Or if you’re fully ensconced in the digital age, have a business card app on your phone such as Dub or Bump. If you have long hair, bring plenty of hair ties. I’m bringing all forms of frizz-fighting ammo. As crazy as it sounds, I’ve been told not to forget to eat or sleep–although I can’t imagine forgetting either. A big breakfast is important to buffer daytime drinking, and I’ve been told to expect to sleep 5 hours or less each night–which means finding time to sneak a nap. Don’t forget your bathing suit and flip flops for the pool! The infamous Ramos Gin Fizz at Tujague's in the French Quarter. Photo by David Grunfeld, The Times-Picayune. Looking forward to arriving in New Orleans the night of the 21st! If we haven’t met yet, look me up and let’s toast a Ramos Gin Fizz! Coming to Tales of the Cocktail? 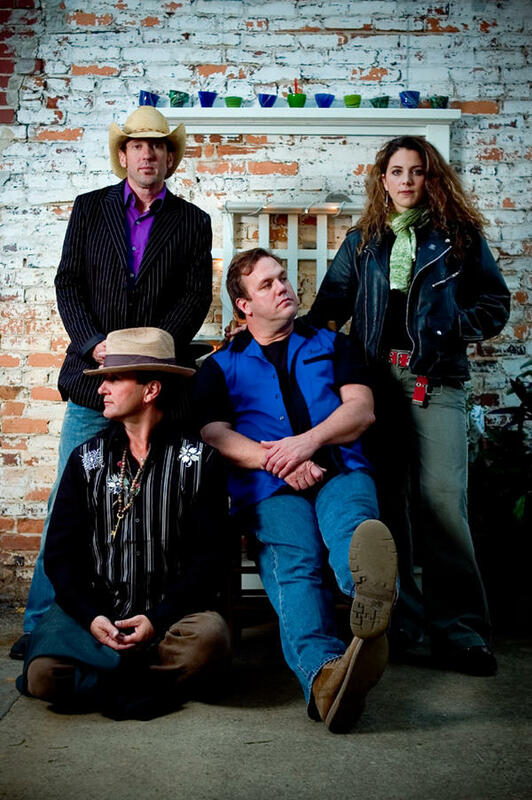 New Orleans' own Cowboy Mouth is headlining the Louisiana Coastal Rehab Party hosted by Don Q Rum on July 22 at Tipitina's. 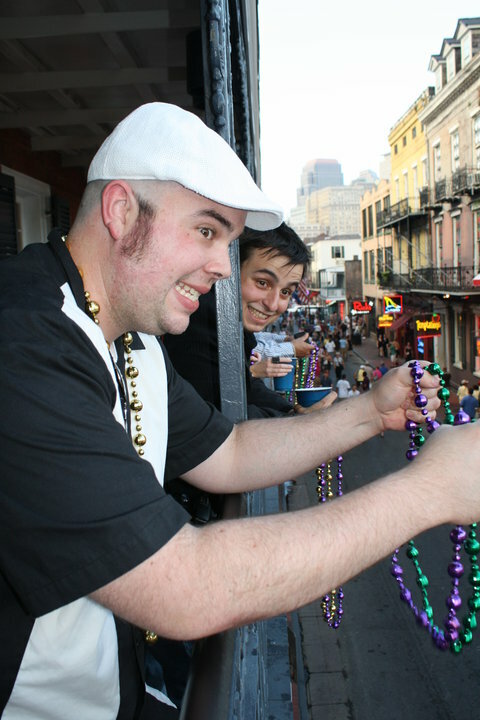 Also in response to the oil spill, Don Q Rum will host the Louisiana Coastal Rehab Benefit Party featuring Cowboy Mouth and ReBirth Brass Band at 10:30 p.m. on July 22 at Tipitina’s in the French Quarter. Tickets are $10 and cocktails will be sold for $4 each, with 100 percent of proceeds going to the Greater New Orleans Foundation Gulf Coast Restoration Fund. 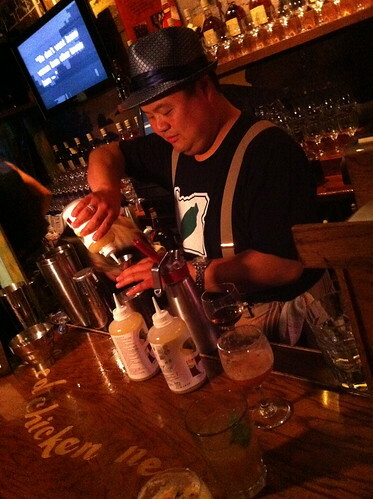 Star mixologists are even expected to jump behind the stick! Miss Mary Cyn performs burlesque at Sunday night's edition of LES Salonnieres. It's going to be bloody fun!